Regulatory compliance has a long reach – often extending across a manufacturer’s supply chain, through processing and on to the packaging line. When it comes to pharmaceutical, food and beverage, and personal care goods, compliance requirements can be especially stringent. The ability to track and trace every aspect of the production process – including the plastic containers in which many products are packaged – is critical. For the plastic bottle manufacturers who serve these markets, higher profitability often depends on their ability to bolster production efficiency and streamline compliance. Since 1968, Jomar Corporation has produced injection blow molding machines that meet the industry’s exacting requirements for both speed and accuracy. Headquartered in Egg Harbor Township, New Jersey, Jomar serves a global client base and enjoys an impressive market share. In fact, more than half of the injection blow molding machines in use today were built by Jomar. Many have been in service for 25 years or more. Unlike extrusion and other blow molding processes, injection blow molding can achieve the strict neck finish tolerances required for tamper-resistant capping, roll-on products, and other specialty applications. The three-stage process takes place via a triangular rotary table that indexes in 120-degree increments. First, molten plastic resin is injected under low pressure into a mold cavity. While the neck portion of the bottle retains the required tolerance, the rest of the resin forms a parison or hollow tube around a core rod. In the second stage, the remainder of the bottle is formed by blowing air through the core rod into the preform. Finally, the mold opens and the bottle is ejected. 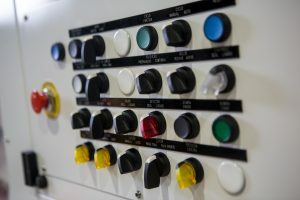 While the initial control system installed on Jomar machines controlled the process parameters, it could not store and recall those parameters on demand. As a result, each time a product changeover occurred, the new parameters were hand-entered into the system. With the existing control system becoming obsolete and regulatory requirements intensifying, Jomar felt the time was right for a new control solution. The new system runs on an EtherNet/IP™ network and also includes Allen-Bradley PanelView™ Plus 6 graphic terminals and FLEX™ I/O, a distributed, modular I/O system. The CompactLogix controller manages all machine functionality and stores process parameters for all product variations run on any given machine. To ease product changeover, these parameters are incorporated in the recipe-driven PanelView interface. Data is also logged in a standard CSV format – and can be easily exported for longer-term storage or reporting. Thanks to FLEX I/O and EtherNet/IP communication, Jomar also streamlined system installation and integration – a critical factor, especially when retrofitting existing equipment. The original control system used traditional rack-based I/O wired through terminal blocks. The new distributed I/O significantly reduces the amount of wiring in the system – and associated time and costs. In addition, Jomar customers should experience lower costs when integrating this machine into their existing EtherNet/IP-based plant networks. And with EtherNet/IP connectivity available, Jomar is now offering remote monitoring services as well.